At a hustings in Aberdeenshire last week, Christine Jardine, who has run a strong tactical voting campaign to save the seat for the Lib Dems, was recorded distancing herself from unionism in a statement that drew gasps from the audience. 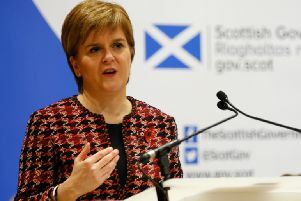 But the remark was seized upon by the former first minister who recently cancelled his international book tour because of concerns he will suffer a humiliating defeat in Gordon despite the SNP surge in support as the Lib Dems pile resources into the seat. Mr Salmond, who endured constant heckling from an angry audience, said: “The reason that [Tory candidate] Colin [Clark] and I were looking somewhat surprised was when Christine declared herself as not being a unionist when she stood on a unionist platform and said ‘I am the unionist candidate, you must vote for me to defeat Alex Salmond’. The Tories hope to win second place in the high profile constituency ahead of the Lib Dems, but have been squeezed by the Lib Dem tactical voting campaign after Ms Jardine last week unveiled a cross-party group of supporters from Labour, the Tories and a Yes voter from the referendum who are backing her. She said: “I spent two years fighting hard to save the United Kingdom. People in Gordon know just how prominent I was in the campaign. The row comes amid questions being asked about polling data published by the Lib Dems in the seats they are defending after Survation distanced itself from the results. In addition a woman the Lib Dems claimed had been a former Tory voter who had switched turned out to have been a Lib Dem candidate three years ago. According to Scottish polls around six in seven Lib Dem voters from the 2010 election have deserted the party, however they claim they are still strong in the 11 Scottish Westminster seats they currently hold.